In honor of WordPress’s fifth birthday, I’ve surveyed about 6000 blogs to see how many are running WordPress. This is the same group that I queried back in January, when I created a spider that harvested the blogs from all of Technorati’s main blogging categories. 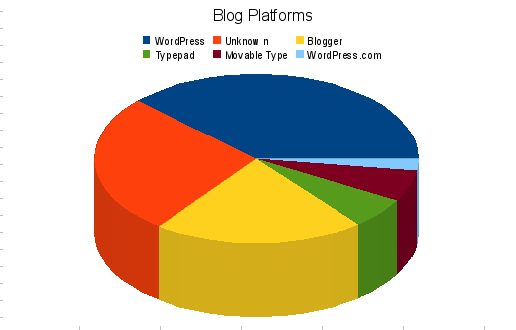 As you can see, WordPress dominates the known blogging platform world. 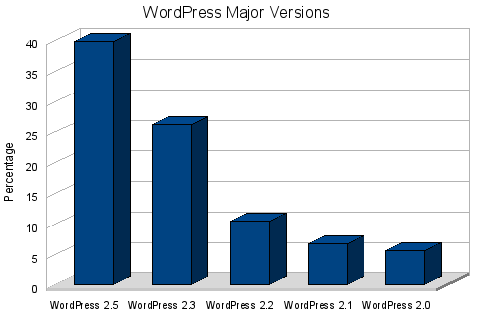 From the numbers below, it looks as though most active WordPress users are keeping updated. Posted in Users | Tagged Technorati, Versions | Bookmark the permalink. Follow any comments here with the RSS feed for this post. Post a comment or leave a trackback: Trackback URL.